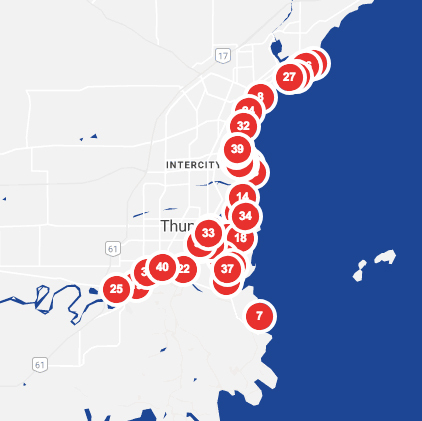 Thunder Bay is a full-service port operating around the clock from season-open in mid-March to season close in January. The Port of Thunder Bay is a full-service port with many facilities and service offerings. Grain elevators in the Port of Thunder Bay ship Western Canadian grain to ports around the world. The Port of Thunder Bay has the largest grain storage capacity in North America and the fastest grain ship turnaround time of all western Canadian ports. Ownership of Thunder Bay elevators includes some of the world’s largest agri-businesses. Wheat, durum, canola, coarse grains, oilseeds, feed grains, peas and other pulse crops, as well as various grain by-products, are handled by the terminal operators. Loading rates at the terminals range from 1,000 to 3,400 tonnes/hour. Thunder Bay’s dry bulk assets include 11 million tonnes of storage capacity, loop tracks, and direct access to CN and CP railways. Coal from Western Canada is shipped from Thunder Bay to domestic and international destinations. Other outbound dry bulk cargoes include potash, urea and various agri-products. Inbound dry bulk cargoes include construction aggregate and road salt. Thunder Bay’s liquid bulk facilities receive inbound petroleum products and liquid chemical products for use in Northwestern Ontario. The Port of Thunder Bay operates a first-class general cargo facility handling project cargo, break bulk, and forest products. Thunder Bay’s project cargo gateway specializes in wind energy cargo and dimensional cargo destined for Western Canadian construction sites, wind farms, mines and the Oilsands.